Spring is around the corner marking the beginning of warmer weather and a great time of year for entertaining outside. It’s the perfect time to organise the right outdoor lighting too. Is your back garden, deck or patio set up with the right lighting to allow your outdoor time to seamlessly integrate from day to night? Landscape lighting is the perfect way to extend your living space, show off your home, highlight specific features of your property, expand your entertaining space, and revitalize your garden. Installing the right outdoor lighting in your home can help bring out its architectural features and helps to create an inviting and atmospheric entertaining space once the sun goes down. Outdoor lighting in your front garden can enhance the curb appeal and make your home welcoming and inviting. 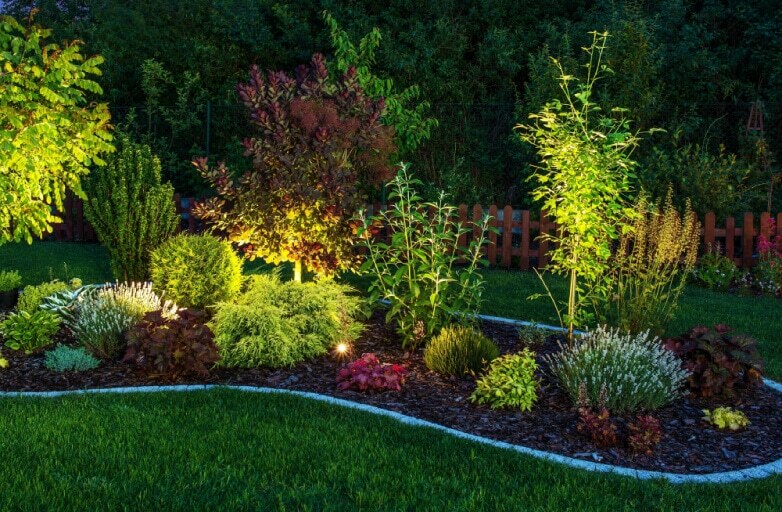 Landscape lighting also plays an important role in the way you use your outdoor space. With the right lighting, you don’t need to move inside on a summer evening once the sun goes down. Landscape lighting gives you the ability to extend your living space and the time you spend outside. Landscaping lighting will shed light on potential dangers, like stairs, drop-offs, pools and tripping hazards, helping to prevent falls or other injuries. Illuminating driveways, paths, walkways and house number helps any visitors to arrive safely and makes your home easy to find. There are several different types of landscape lighting depending on your needs. Up-lights and Downlights are great positioned under planters and steps and in your garden to highlight certain feature trees and plants. In-ground fixtures can also line paths, illuminate swimming pools, or create mood lighting throughout your garden. Floodlights are great for lighting up a large area. There are lights that create atmosphere, enhance features, and lights that are functional and convenient. If you are based in Hornsby, the North Shore, Castle Hill or surrounds and need some landscape outdoor lighting added to your home, give our friendly team a call on 9477 2550 to organise one of our local electricians to come to you.